Fred Warmbier, father of an American student who died after being jailed in North Korea, will accompany Vice President Mike Pence when he attends the 2018 Winter Olympics in Pyeongchang, South Korea. The elder Warmbier will be part of the U.S. 2018 Winter Olympic delegation as Pence's guest, the Washington Post reported Sunday. The vice president will head the delegation after a five-day diplomatic trip focused on convincing Asian nations to keep pressure on the North Korean regime. Otto Warmbier was finishing up a five-day tour of North Korea in 2016 when he was arrested by authorities, allegedly for trying to take down a poster in the hotel where he was staying. Warmbier received 15 years hard labor for the minor infraction, prompting international outrage. The University of Virginia student was finally released by North Korea in June 2017 after sustaining a neurological injury in captivity and falling into a coma. The 22-year-old never recovered, dying in the United States only a week later. Pence's invite comes after President Donald Trump also invited Otto Warmbier's parents to attend last week's State of the Union address. During his address, the president pointed to Warmbier's death as reason why continued pressure on North Korea is necessary. 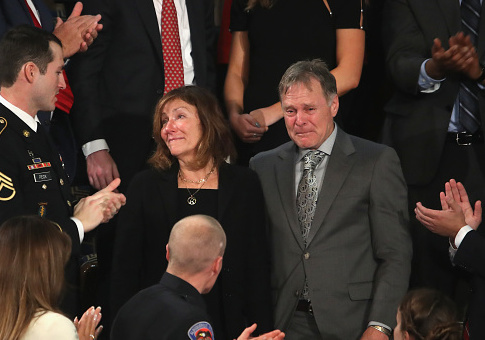 "Otto's Parents, Fred and Cindy Warmbier, are with us tonight–along with Otto's brother and sister, Austin and Greta," Trump said. "You are powerful witnesses to a menace that threatens our world, and your strength inspires us all." This entry was posted in National Security and tagged Mike Pence, North Korea, Otto Warmbier, South Korea. Bookmark the permalink.